No one can SPREAD THE LOVE like Butch Garcia can! When Butch Garcia first created his Alugbati Spread to share with friends, I was skeptical. Alugbati? Really? That obsequious and ordinary plant that grows wild in gardens and empty lots? The spread looked extremely green! But the moment I tasted it, it blew away all prejudices. It was an extraordinarily delicious surprise to the palate — rich and luscious and flavorful! Not at all as grassy as I imagined alugbati would taste. 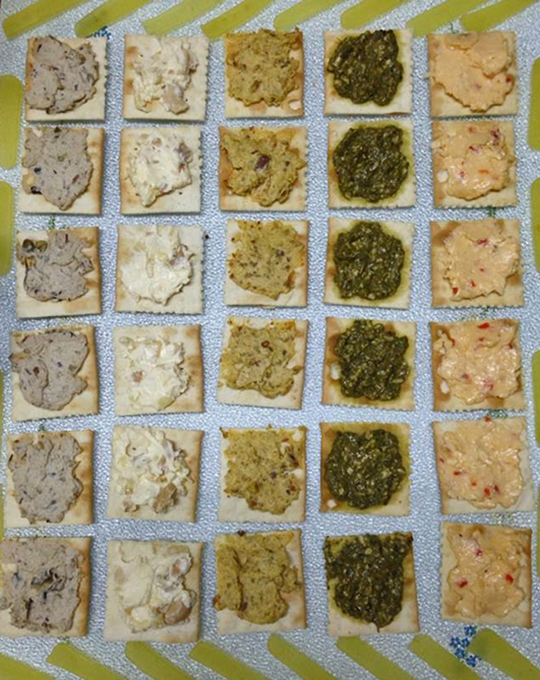 In fact, it reminded me of Cibo’s Spinaci Zola dip, but fuller-flavored. 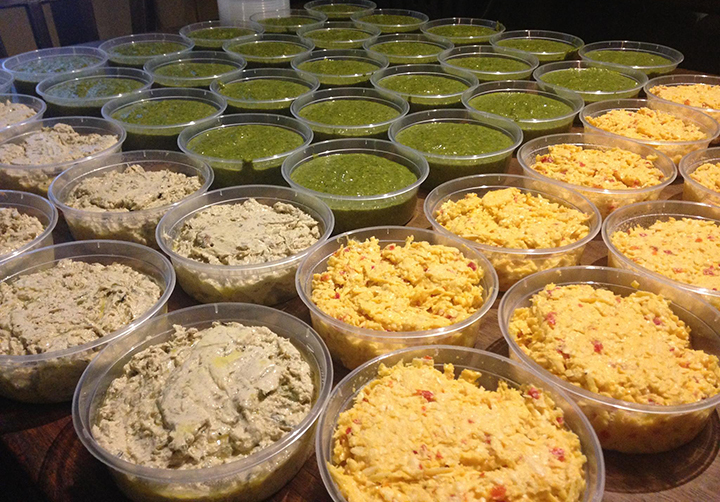 Butch’s Alugbati Spread came about one day when he wanted to do a pesto sauce. However, that day, he could not find any basil anywhere with which to make it. Not in the supermarkets, not in the delis, not even in anyone’s garden. Ever the inventive mind and impeccable palate, Butch decided to use alugbati instead. Makes sense — it is, in many ways, our local equivalent of basil. The instant acceptance and exuberant appreciation of his Alugbati Spread inspired Butch to develop other delectable spread ideas. His next product was his Quezo de Bola Pimiento Spread, which was his grandmother’s recipe, tweaked and perfected according to his supremely fine-tuned taste. That, too, was an immediate success. Salty, cheesy, but with umami depth. 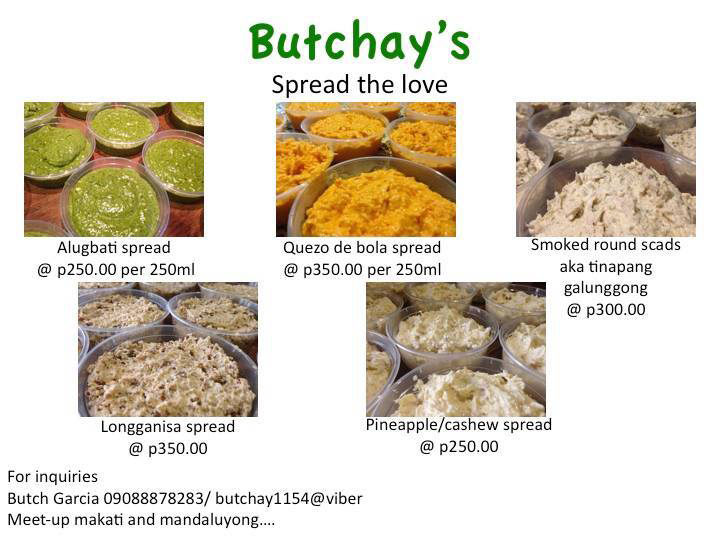 From then on, Butch’s concoctions have expanded to other spread creations — Smoked Round Scad Spread (or Tinapang Galunggong), Longganiza, Pineapple-Cashew, and “Bicol Express”. The “Bicol Express” is one of my pinaka-favorites! The heat is subtle, tempered by the cream and dissembled by the bread or cracker. But the combined piquancy of Hungarian sausages and the jalapeño and cayenne peppers soon unfurls gradually in the mouth with every flavorsome bite. It goes absolutely perfectly with ice-cold beer or very chilled wine. The popularity of his spreads, well, have spread like wild fire! Simply through the power of social media and gratified friends’ word of mouth. “Spread the love!”, Butch would say, with his customary chuckle. And it was his very own words which became the brand name for his spreads, upon the suggestion of his fellow-foodie friend in advertising, Ana Perez. His daughter Belai and her best friend Andi Harn came up with the design of the label — congenial, honest, warm, and down-to-earth. Seeing it will make you smile. Tasting his spreads will make you swoon in joy. 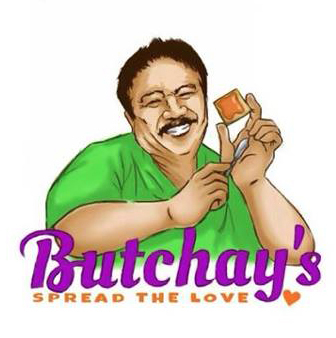 And it is with joy that I simply must share with you what Butch’s SPREAD THE LOVE spreads are all about … whilst snacking on the Bicol Express on skyflakes crackers. 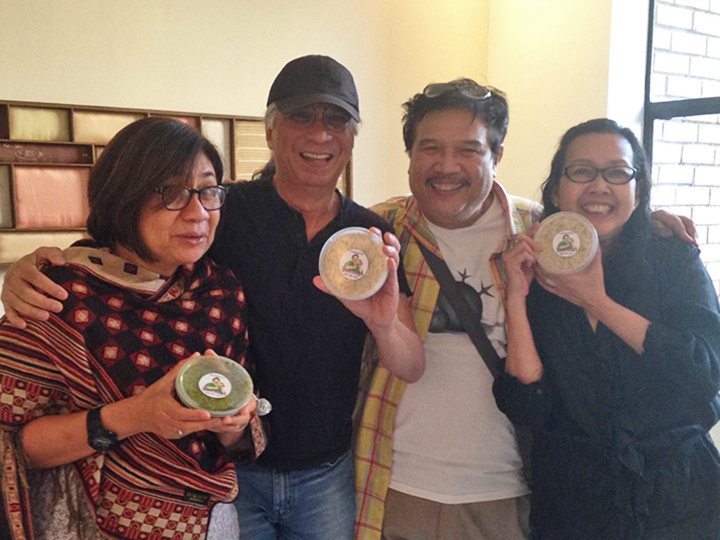 People from the film and advertising industries know Butch Garcia not just as one of the country’s most prominent production designers, but also as a supreme connoisseur of good food with a big appetite and a big heart. And it’s only right that his array of delicious homemade spreads be called SPREAD THE LOVE. It is, after all, everything that Butch Garcia is all about.